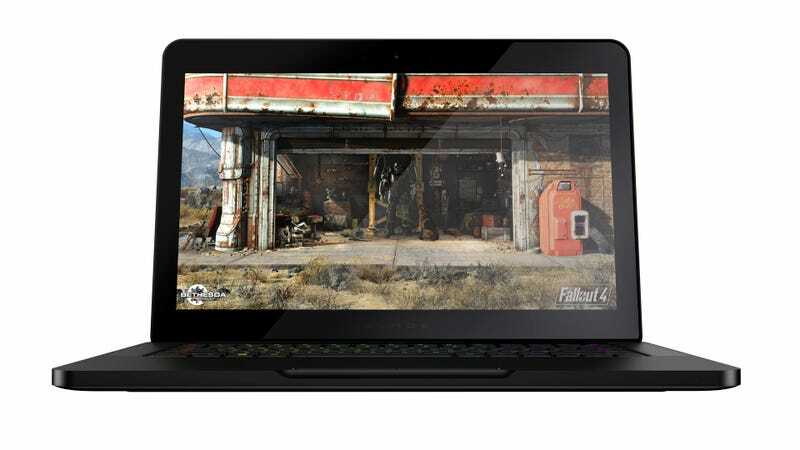 Announced today using the same Fallout 4 screenshot they used while announcing the Razer Blade Stealth ultrabook earlier this year, the new 14-inch Razer Blade ultra-skinny gaming notebook is packing a lot more power than its predecessor at a slightly better price. Before we get to the less important aspects of the new 14-inch Blade, up for preorder tomorrow on Razerzone.com and shipping in April, let’s address the most important feature. Yes, each keyboard key is individually backlit and fully customizable. Game developers are free to develop profiles for their games that utilize these lights for special effects, like flashing red and blue when the police are after you in Grand Theft Auto V.
Pretty lights. Also pretty light. The system also houses several components that help make it more of a computer than a numbered and lettered light show. They’ve got a 6th generation Intel Core i7 in there, a Nvidia GeForce GTX 970M chip with 6GB of VRAM (pronounced vraaaaam) and 16 gigs of system memory, which is more than we’ll ever need until we need more. There’s a 3200 x 1800 multi-touch display for folks who like their Windows icons nice and tiny, and a whole list of other nice bits that I’ve included down below. That entire list weighs only 4.25 pounds when inserted in an aluminium chassis. Eventually these pictures will just be black single pixel lines. What’s most impressive about the new Blade (aside from the keyboard) is the price. The previous, less-powerful version of the system started at $2,399. This one starts at $1,999. That’s still a hell of a lot of money, but compared to other super-skinny laptops with these sorts of innards it’s pretty competitive. Guessing that Lenovo partnership helped smooth out the supply line. As a special added bonus, the light and powerful system can be made even more powerful by adding Razer’s Core box, which adds plug-and-play external graphics card support through the system’s Thunderbolt port. That’s a lovely list right there. The new Razer Blade will be up for preorder tomorrow at Razerzone.com if you’re so inclined.